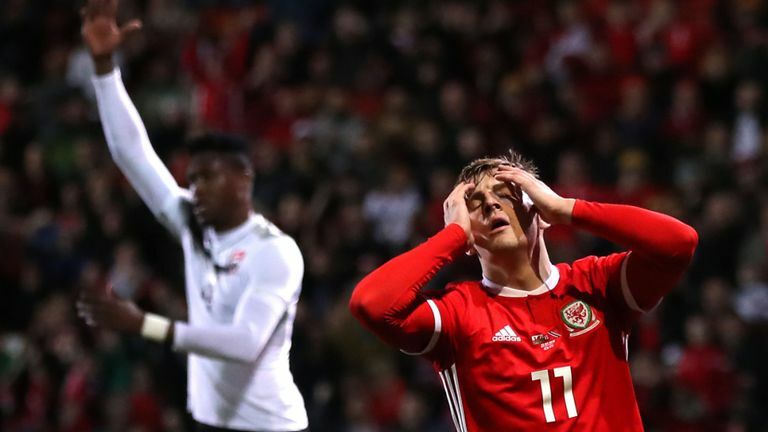 Ben Woodburn's 91st-minute goal saw Wales edge past Trinidad and Tobago 1-0 in an international friendly ahead of their first European Qualifier on Sunday. The warm-up game at Wrexham looked to be heading for a goalless draw until Liverpool forward Woodburn turned home a Will Vaulks cross late on for a confidence-boosting victory. Trinidad and Tobago were well drilled for much of the game, with their best chance coming on the hour when Aubrey David's shot was cleared off the line by Chris Gunter. There were a few half chances in the opening 15 minutes. Tyler Roberts nodded a Ryan Hedges cross into the arms of Trinidad and Tobago goalkeeper Marvin Phillip before Khaleem Hyland's shot from the top of the area went straight at Danny Ward. Hedges was involved again not long after as he received a Gunter cross, but his shot was collected well by Phillip. Wales twice went close just before the half-hour mark. Vaulks fired an effort towards goal, but it smacked off the body of Daneil Cyrus before going behind for a corner. Trinidad and Tobago initially managed to clear the set-piece but a give-and-go between George Thomas and Lee Evans saw the former take on the shot, but it went sailing over the crossbar. Gareth Bale was not in Wales' matchday 18 despite being fit, with Aaron Ramsey also missing out with a thigh knock. Will Vaulks made his debut, while Ryan Hedges, Lee Evans and George Thomas made their first starts. Wales kept probing after the break, and forced Phillip into a great save in the 57th minute. After some wonderful footwork, Woodburn slid the ball into the feet of Thomas who smashed the ball towards goal, but the Trinidad and Tobago goalkeeper was waiting to palm it behind. Three minutes later, and Wales had to clear the ball off the line. Levi Garcia got into the area - skipping over the oncoming goalkeeper Adam Davies - but he could not get his shot away, and passed the ball to the waiting David. He then took on the shot, but Gunter was waiting on the line to clear. Wales were in the ascendancy for the remainder of the game, and continued to see chances come their way. Indeed, they had the ball in the back of the net in the 67th minute as Thomas flicked the ball home from a Hedges cross, but it was correctly ruled out for offside. But they found the breakthrough in the first minute of four added on. Woodburn began the move himself, lofting the ball into the middle of the area for Hedges, who saw his shot blocked. 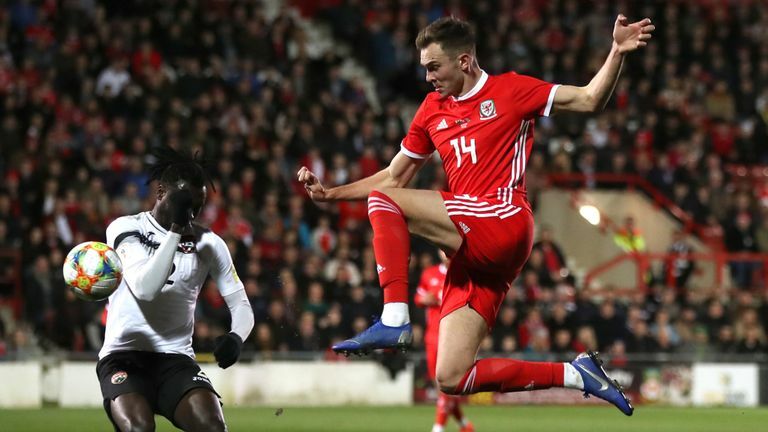 Vaulks was waiting to pick up the loose ball before standing it up at the back post for Woodburn as he guided it home with his chest to seal the win for Wales. This was Wales' first match at the Racecourse Ground since a 3-0 victory over Norway back in February 2008 under John Toshack. Indeed, including their victory tonight, the Dragons are now unbeaten in their last five matches in Wrexham (W4 D1). Ben Woodburn's winner was his second ever goal for Wales, with both goals for his country coming in 1-0 victories at home (also 1-0 v Austria in September 2017). It was an impressive debut from the Rotherham midfielder. He looked lively going forward, making great crosses and attacking movements as Wales looked to get past Trinidad and Tobago. He was rewarded late on with an assist for Ben Woodburn's goal, with George Thomas and Ryan Hedges also deserving an honourable mention in Ryan Giggs' youthful side. Wales: Ward (6), Gunter (7), Taylor (7), Dummett (7), Williams (7), Vaulks (8), Roberts (7), Woodburn (7), Thomas (8), Hedges (8), Evans (7). Subs used: Davies (6), John (6), Lawrence (6), Matondo (4). Trinidad & Tobago: Phillip (7), David (7), Bateau (6), Cyrus (7), Hyland (6), Plaza (6), Garcia (6), Lewis (6), Hodge (6), George (6), Paul (6). Subs used: Cato (5), Peltier (7), Hackshaw (5). Man of the match: Will Vaulks.